Tall, HD-munching oaks from tiny acorns grow! The much-anticipated Atom is a fairly incredible low-power, low-profile chip, coolly redefining what sub-notebooks and basic web PCs are capable of. Potentially, it also redefines small, silent media centre systems too. We'll get to that in a minute, but first the loathsome . For all its impressive beef, Intel doesn't want Atom to steal Core 2 Duo's thunder, so it's being remarkably stingy with its new chip. Want a PCI-E graphics slot on there? No dice. Want to stick it into a full-size notebook? Sling yer hook. This is being kept at arm's length from performance PCs. Which seems a terrible shame - comparing it to the Celerons found in existing Asus Eees and the like is startling. Unlike those, this 45nm, 4W, 1.6GHz hyperthreaded chip can stomach 720p x.264 video cheerfully (though it panics if you attempt anything else during playback), and is almost three times as fast at encoding to DIVX than the 900Mhz Celery in the Eee 701. Throughout, it barely hits 40 degrees despite its laughably tiny passive cooling, it looks like a desktop processor from 1992, but performs like one from 2005. Unfortunately, it's not quite there for 1080p, even when overclocked to a stable 1.92GHz. Just a little more poke and it'd be an incredible media centre platform. Alternatively, a recent 3D card handling the decoding would sort it out, but no PCI-E slot spells the death of that dream. Or does it? 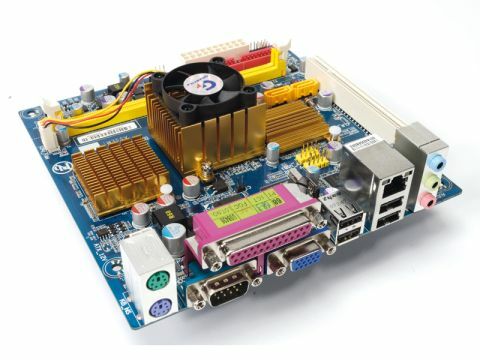 The PCI slot on this Gigabyte Mini-ITX board - which comes with the Atom integrated -seems useless at first sight, but we've just heard that Albatron is releasing a range of cut-sized PCI GeForce 8500s. Clearly not much cop for gaming, but their HD decode clout should give the Atom the leg-up it needs. This little board could be the future of your AV setup, nestling in an attractive enclosure near your TV and speakers. Intel will not be at all happy. Let the processor war commence! Especially with VIA's rival Nano on the close horizon, reportedly offering superior performance per watt and not suffering pointless platform restrictions. Which, excitingly, means the processor war - once presumed won by Intel - is back on, but waged on a front we didn't expect. The notebook end of the market's about to get very, very interesting.